Vampires have been the laughing-stock of the monster genre for some time now, mostly thanks to Stephanie Meyer and her warped view on teenage romance. We snigger when we think of them sparkling in the sunlight instead of burning up like a bonfire, and we cringe when we see that most if not all of the undead look like beings that had been taken straight from a Hollister catalogue. They are, for the wrong reasons, comedy gold. So, the challenge is set for What We Do In The Shadows to get us to intentionally laugh at vampires, and thankfully it is not only successful in that but also in bringing something sorely missing from current vampire lore: a soul. Though the humour is solid all the way through and generates big laughs when poking fun at the whole mythology, what makes the film truly work is its characters. In an age where bland, stalker-y types like Edward Cullen can be considered as a fully-rounded character by the masses, these particular vampires are each given unique strands of charm that help them stand out as their own individuals as well as just another clog in the machine. There are four in total that the “film crew” follows about – the film is presented in the mockumentary style that benefited This Is Spinal Tap before it – including the ever-chirpy Viago (co-director Taika Waititi), the rebellious Deacon (Jonathan Brugh), ladies man and “bit of a pervert” Vladislav (co-director Jemaine Clement), and silent Nosferatu lookalike Petyr (Fransham). They each have their own goals, ways of life and separate personalities that we find ourselves liking against the odds, despite killing and sucking people’s blood being one of their many everyday routines. These are fun, easy-to-warm-to characters that we’re fully on-board with following to the film’s end, and that is why future vampire films should take note from this film: if you want people to give a crap about your fanged creatures, actually make them characters instead of caricatures. It will seriously benefit you and your film if you do. For all its character-based warmth, the film has a strong gag count that neatly fits it among some of the year’s funniest comedies. Jokes about vampire clichés dominate, from their lack of reflection in the mirror (Viago uses the opportunity to present his “ghost cup” trick) to their particular taste in virgin blood (Vladislav’s comparison to a sandwich results in one of the funniest zingers all year). It even manages to think outside the box and take stabs at other mythologies, including a pack of werewolves led by Flight of the Conchords’ Rhys Darby constantly trying to keep their cool (“werewolves, not swearwolves”) and a zombie that is annoyed by the commonly accepted stereotype of the brain-dead groaner. By doing that, it creates a strangely inviting world that works as its own three-dimensional environment, and that’s not just because it all takes place in Wellington, New Zealand. Sometimes, the humour comes just from pure presence; Viago’s innocently eternal smile even in the drabbest of situations makes for comfortable chuckling, while the awkward reactions of human Stu (Stu Rutherford) – a friend of recently-turned vampire Nick (Cori Gonzalez-Macuer) who later accompanies our three protagonists on their night-time adventures – looking out of place is also very well-handled and mined for good laughter. There is build-up for another character, an enemy of Vladislav’s known as “The Beast”, which is so disconcerting and fearful that it makes the eventual reveal all the more hilarious and, without giving it away, is in keeping with his character. Some of you might wonder why this reviewer liked this film, which is essentially one joke stretched to feature length, more than they did Life After Beth, another one-joke premise. With that film, it seemed as though it was all built around that one gag without any interesting characters or funny jokes to support itself with. 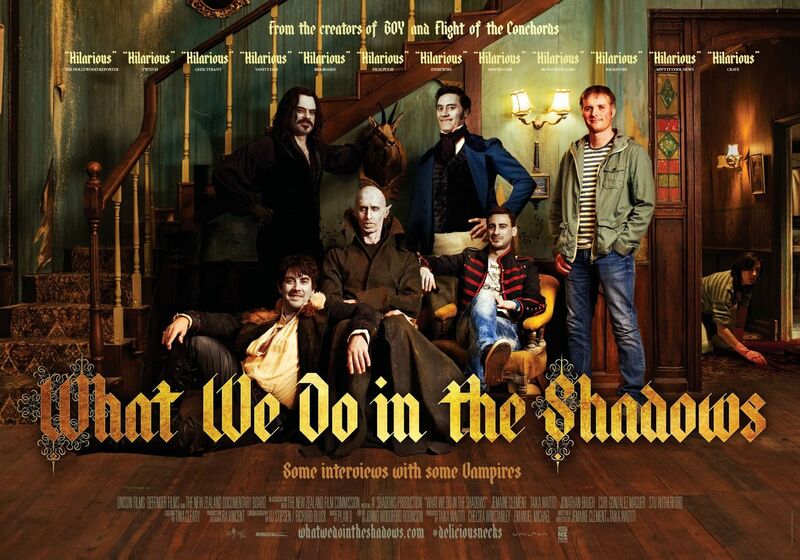 It’s different with What We Do In The Shadows because not only are the jokes they come up with funny and enjoyable but the characters are so likable and entertaining that they are enough to make you oversee its thin premise and sitcom nature. This film works so much better than Life After Beth because it actually tries to be more than just a funny punchline, and creates an extremely hilarious slice of fun as a result. You may think vampires are sucky now, but once you see What We Do In The Shadows – the year’s definitive vampire flick – you’ll be laughing WITH them instead of AT them which, in a genre tainted by Meyer’s warped sense of the world, is an achievement in and of itself. 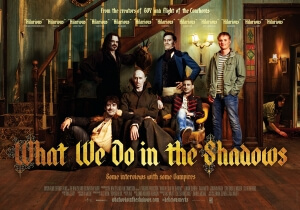 What We Do In The Shadows is a very funny horror-comedy with plenty of gags to choose from, but what ultimately makes it work is its likable and personality-driven fanged characters which proves to the world that they can be more than just the brooding archetype we’ve been getting over the past few years.